If you’ve been following my blog for a while you know that I really enjoy travelling. If you’re new to my blog, WELCOME! I have been very fortunate to travel to lots of cool places including Venice, Amsterdam and Morocco. I’m actually posting this blog right now from Arizona! As much as I have travelled abroad, there are many places I have not visited or explored on my island of Anguilla, which comprises just 35 square miles. I enjoy vacationing and taking holidays, however lately I am really starting to appreciate the value of a staycation. A staycation is basically taking a vacation in your home country rather than going abroad. This might involve a stay at a local hotel or staying at home but visiting different local attractions. How awesome does that sound? As someone who loves to travel but hates flying, a staycation is the perfect compromise. 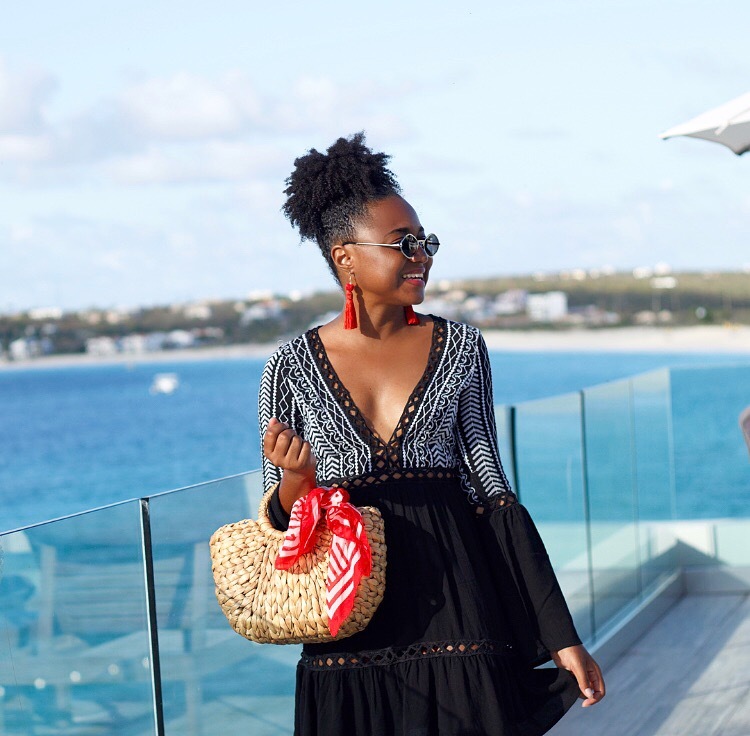 A few weeks ago I got the opportunity to collaborate with Four Seasons Resort and Residences, Anguilla and stay at the property for 3 nights/4 days. Honestly, it felt like I really was on vacation abroad. 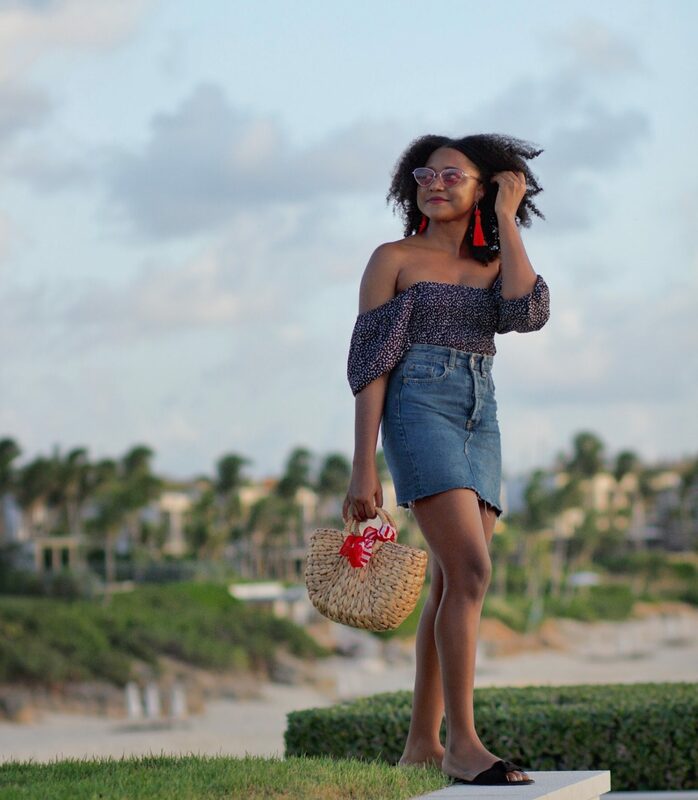 I had to remind myself several times that I was actually still in Anguilla and that home was just 30 mins away (which was a sweet perk as I could just pop home if I needed anything!). The property includes private rooms, villa and residences options, several restaurants and bars and a great array of activities for persons of all ages! 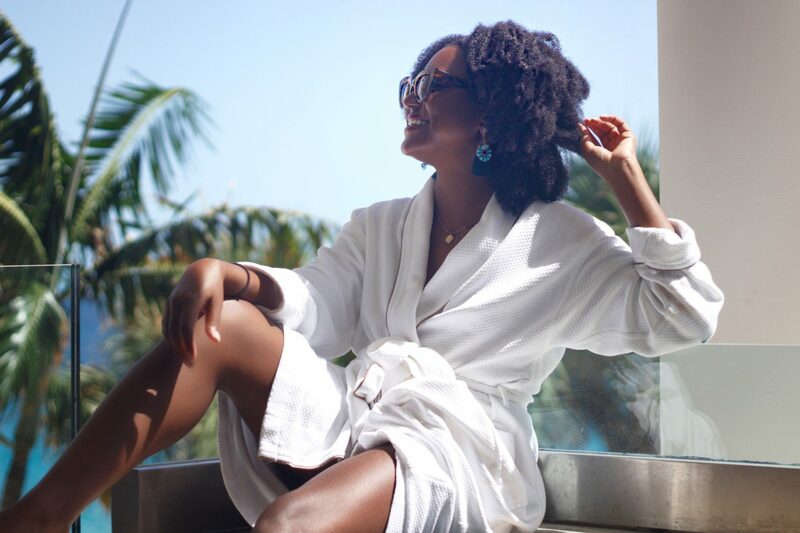 Continue reading to find out what I did during my stay and my personal tips for having an amazing staycation! One of the things I love the most about vacations are that they are an opportunity to splurge a little. Stay-cations are no different. If you’re fortunate to live in a city that most people would love to visit why not treat yourself to a stay at one of the best local hotels? The good news is you’re saving on the flight, so go ahead and book a night or a weekend at that luxury hotel/resort you’ve always wanted to try. You deserve it! We stayed in a gorgeous one bedroom suite with the cutest bathroom I have ever seen. Robes and slippers were provided which we practically lived in for a good portion of our stay. One of the best features of our room was the large private balcony overlooking the Aleta Pool and the ocean. There was also a private plunge pool which was a great addition! When I travel, I usually end up having one of those ‘vacations you need a vacation from’ because I try to fit in as much as possible. This particular staycation was really nice because I was actually able to really enjoy my room and all its amenities! Food is Life! Too often many of us get so caught up with the daily grind of life that we forget to enjoy one of the simplest pleasures of life – a good meal! There are times when I can get so consumed working on a project that I forget to eat or I end up eating something extremely unhealthy like fast food or a bag of chips. Fine dining is a luxury that very few people actually indulge. Staycations are the perfect opportunity to indulge a little. Book a reservation at that fancy restaurant you’ve always wanted to try! Go ahead and eat the damn $15.00 cake! Even if you spend the rest of the year eating noodles, at least you will always have the memory of that delicious, mouth watering, cooked to perfection Rib Eye Steak. As a self proclaimed foodie, one of the things I was most interested in during our stay was sampling the food at the various restaurants across the property. 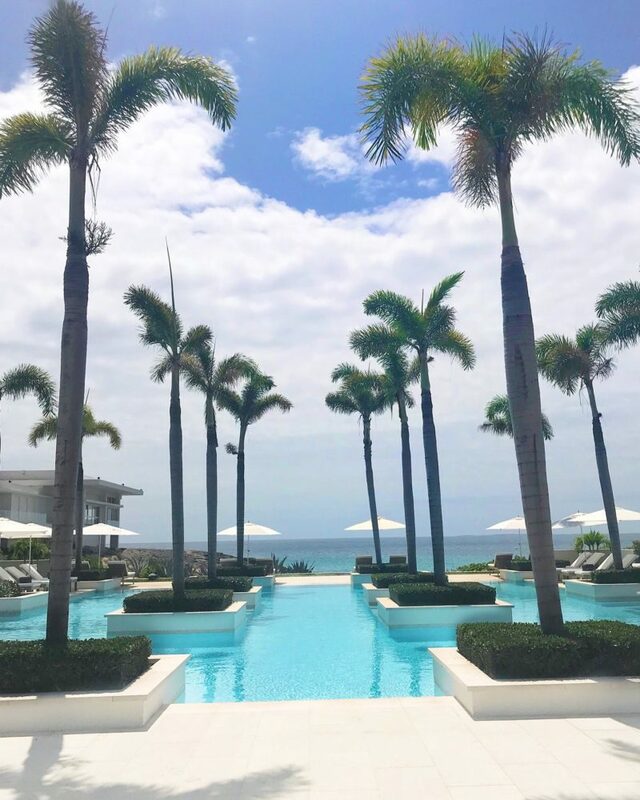 There are four restaurants and bars at the Four Seasons, Anguilla and you can also opt for in room dining, which we did as well! 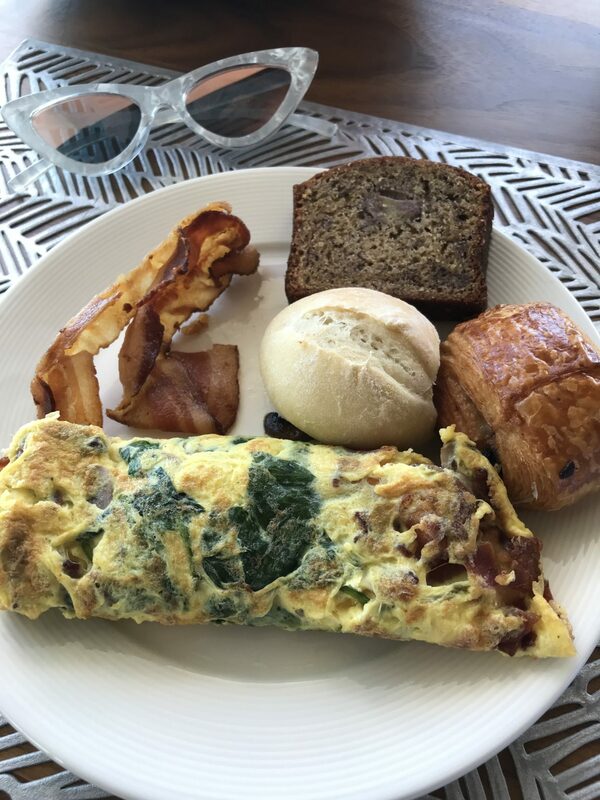 We ate breakfast at Coba for the entire stay, opting for the buffet option each day. You can also order breakfast off the menu but the buffet had everything and more that we could possibly want or even eat! I’m not a huge breakfast person so a spinach and cheese omelet with some toast, a bit of fruit and the occasional pastry was all I really needed. For lunch, we tried the fish taco’s at Half Shell Beach Bar along with Deans Green Supreme to wash it all down! We tried a different restaurant each night for dinner and it was all amazingly good! It really depends on the type of cuisine your’re in the mood for. Coba provides a more upscale dining experience with food to match, Sunset Lounge has a great selection of sushi and Asian inspired dishes and Bamboo Bar and Grill is the place to be on Friday nights for Caribbean seafood cuisine – buffet style! If you’re not sure which one to try, I recommend the rib eye steak at Coba, it’s delicious! The phrase ‘You need to step outside your comfort zone‘ is, completely overused these days. I’m sure we’ve all heard it, applied in different contexts, several times. However, it really is some solid advice. Life can get pretty monotonous, particularly once you develop a routine and there is always a danger of becoming stuck or complacent. It’s important to shake yourself up a little now and then and do something (positive) that you would never normally do. Be bold, be adventurous, be spontaneous! The best part of your staycation will be the memories you gain of all your new experiences. Whether your experiences were good or bad, one thing is certain, you will definitely have a story to tell! 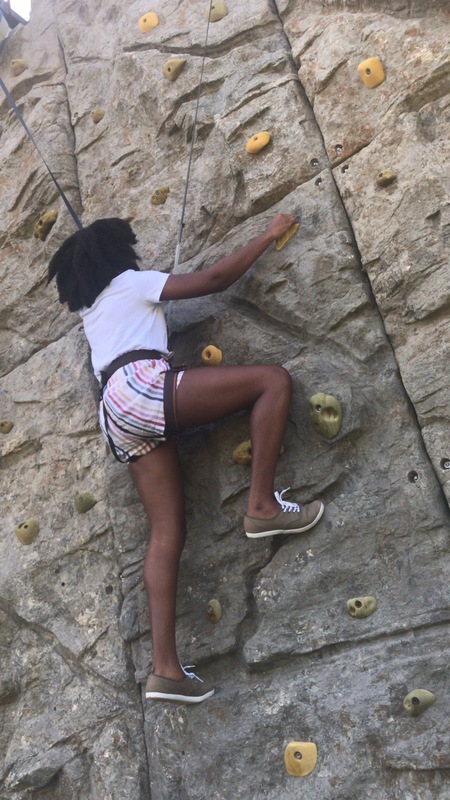 I had been wanting to climb a rock wall for a long time, so I was quite excited to try this activity on our final morning. From that experience, I learnt that there are three key things everyone should know about rock climbing. Firstly, it’s a lot harder than it looks! Secondly, wear comfy and long clothing. I wore shorts and ended up scraping my knee a few times attempting to climb the wall. Ouch! Thirdly, it is not for those with a fear of heights! I am not particularly afraid of heights but looking down from halfway up the wall (that’s about as far as I got lol), the ground seemed super far away which was a bit unsettling. However, it was actually quite fun and I would recommend trying it at least once! Water sports, tennis and basket ball are also available via the Sea Centre and Sports Pavilion. If you’re looking for more low key activities, simply relaxing in your room or even poolside is a good option. The beds were super comfy, room service was great and the WIFI was strong. That’s all you really need anyways right? If you still want more however, there are several pools at the resort including my personal favourite the Aleta Pool. I loved the concept of palm trees in the pool and there is even a new floating bar option that you can request. Of course, there probably is no better way to relax than to book a treatment at The Spa at Four Seasons Resorts. My boyfriend and I had a couples massage and it was pure bliss! It was actually my first time getting a professional massage and I’m really glad I FINALLY got around to actually booking and keeping an appointment. Massages are definitely worth the hype! If that’s not your thing there are other treatments including facials, manicures and pedicures. Are you guys fans of stay-cations? Have you stayed at a Four Seasons Hotel before? Let me know in the comments! Sounds amazing and you are absolutely glowing!